Change is inevitable. You can either try to ignore it, accept it, embrace it, or dive straight into it. Because really, change will come whether we like it or not. A couple of days back, I entered a Rapid KL bus bound for UKM and was greeted by the sight of passengers flipping through a couple of blue and red pamphlets. There was a pile near the bus driver’s seat and since the encik was still with his bus driver comrades, I helped myself to a pamphlet of my own. Interesting. When I came here to Malaysia 1.5++ years ago, Rapid KL had these RM 1 tickets that the passengers could use the whole day. It was like a ride-all-you-can experience. After some time, they probably realized that the busses were getting low on dough. So they told the passengers that the tickets would now be good for only a single journey. That was fine with the people who’d soon readily present the magic blue bill every time they’d enter the red, blue, and yellow bus. 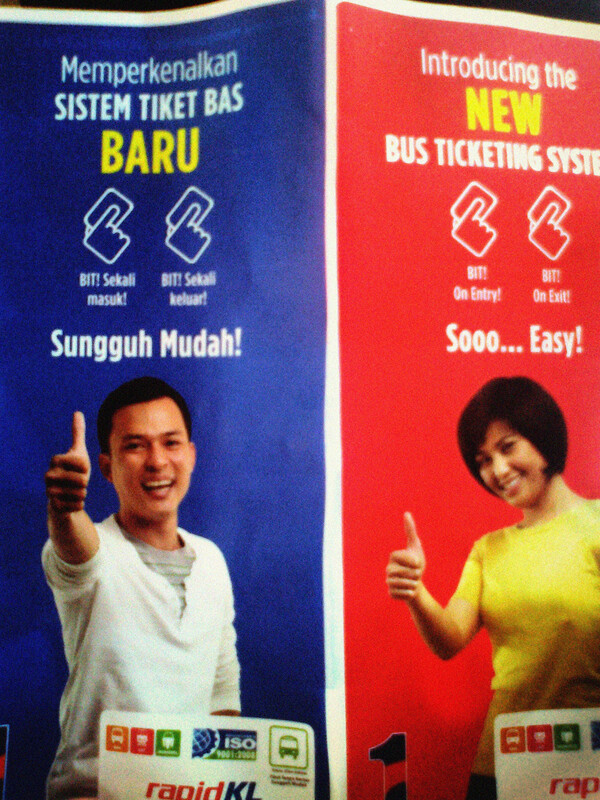 So now they’re promoting the use of touch-n-go cards, like the ones Singaporeans use when commuting. Really, the Rabbit Card that I bought from the bus driver yesterday made me laugh out so, so loud. It’s the year of the funny bunny, alright. I bought a card yesterday though I had been planning to get one ever since I read the Rapid KL pamphlet. I figured it would do me good. I wouldn’t have to worry about keeping RM 1 notes in my wallet all the time, plus I’d save up around RM 2 a week. I use Rapid KL busses like Filipinos use jeepneys and RM 2 is sorta a lot. I could buy a nice cup of teh tarik with that. Anyway. Well, now, I’d just bit, bit, bit away at the cost of RM 0.80 per way. However, I couldn’t help myself to a card immediately because the Rapid KL drivers were still easing up the transition stage. Transition. I watched how the drivers discussed and had these impromptu tutorials inside one of the empty buses behind us the other day. I reckon they didn’t know how to use the card readers yet, so they had to get acquainted with them first. They had to, before they could even expect their passengers to do the same. They had trouble implementing the whole thing during the first day, but yesterday, this guy rode with all the passengers and explained how the whole thing worked. I watched how the encik patiently explained everything to the passengers. 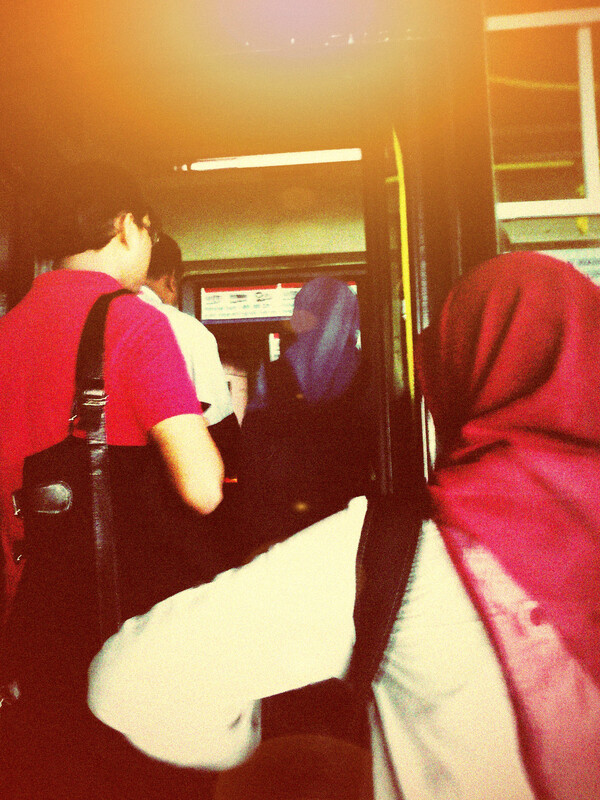 I listened as one Malay girl asked all the FAQs running through every passenger’s mind. I had already decided that I would buy a card from him, but it was interesting to watch the whole introduction process unfold before my eyes first. After the guy’s detailed explanation, a couple of people (me included) bought Rabbit Cards of their own. Today, quite a lot of people were already using them though some still had trouble “Bit-ing” the cards the right way. “Sila cuba kad sebelah lagi”. Well, it’s going to take some getting used to, but pretty soon everyone would probably be doing it like it’s their second nature. Sigh. So many changes this season. But like I said. It’s going to take some getting used to. But sooner or later, it’s all going to be second nature.